Applied studies scholarship has triggered a not-so-quiet revolution in the discipline of ethnomusicology. The current generation of applied ethnomusicologists has moved toward participatory action research, involving themselves in musical communities and working directly on their behalf. 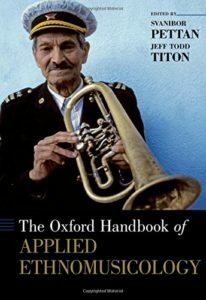 The essays in The Oxford Handbook of Applied Ethnomusicology, edited by Svanibor Pettan and Jeff Todd Titon, theorize applied ethnomusicology, offer histories, and detail practical examples with the goal of stimulating further development in the field. The essays in the book, all newly commissioned for the volume, reflect scholarship and data gleaned from eleven countries by over twenty contributors. Themes and locations of the research discussed encompass all world continents. The authors present case studies encompassing multiple places; other that discuss circumstances within a geopolitical unit, either near or far. Many of the authors consider marginalized peoples and communities; others argue for participatory action research. All are united in their interest in overarching themes such as conflict, education, archives, and the status of indigenous peoples and immigrants.